Tekno Autosports is the latest team to reveal a revised look for one of its entries ahead of the V8 Supercars Championship’s first foray to the United States of America. 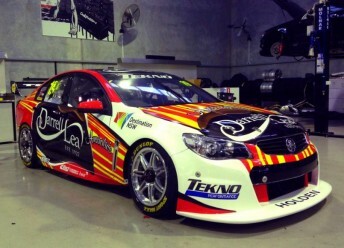 Jonathon Webb’s #19 Holden will carry primary backer Darrell Lea’s ‘export branding’ in Austin. The confectionery company, which was bought by petfood magnate Tony Quinn last year, has been exporting its products to the US since 2005. The team has also picked up minor support for the event from the New South Wales Government’s tourism and events authority, Destination NSW. Webb’s entry had run major signage promoting a NSW Government campaign, Project 40, at the pre-season test and Clipsal 500 Adelaide earlier this year. Ford Performance Racing and Brad Jones Racing have also recently inked deals with tourism authorities in Austin, Texas, and the Northern Territory respectively. Webb sits 11th in the 2013 V8 Supercars Championship heading to the US despite a horror run at the most recent round at Barbagallo.